Under the official Language Policy of the Government of India, the Institute has a well established ‘Hindi Department’ to assist and promote work in Hindi. To acquire working knowledge of Hindi – Prabodh, Pravin and Pragya examination are conducted by Hindi Department, under the Hindi Teaching Scheme of the Central Government. Workshops are organized periodically to improve /enhance the knowledge of institute staff for working in Hindi. Efforts are being made to maximize the use of Hindi in day-to-day work of the institute in particular in Medical, Paramedical, Vocational and academic department. Hindi Teaching Scheme was started under the then Ministry of Education in 1952 to impart training of Hindi to those central government employees who do not possess the working knowledge of Hindi. The Hindi Teaching Scheme was brought under the Ministry of Home Affairs in 1955.The training of Hindi Language, Hindi Typing and Hindi Stenography under the Hindi Teaching Scheme was made compulsory in 1960. 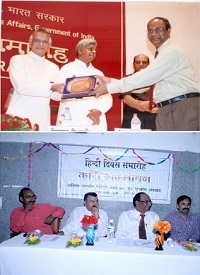 The vision of Hindi Teaching Scheme is to train all the personnel of the institute ; so that they can achieve proficiency in Hindi Language, Hindi Typing (Manual)/Hindi Word Processing (Computer) & Hindi Stenography and all the Official work can be done in Hindi, in compliance with the provisions of the Constitution. Hindi Department organizes various Workshops on administration-related topics , throughout the year to enhance the use of work in Official Language. Under the auspices of Central Hindi Training Institute training programmes of Hindi typing and Hindi Shorthand respectively is being organized for the employees. The purpose of this course is to be trained the employees in typing & shorthand as soon as possible so that they could be efficient in Hindi typing & Hindi stenography. Institute celebrates Hindi Day on 14th September and the entire month of September is celebrated as Hindi Pakhwara including various competitions focusing the use of Hindi as an Official Languange. In a view to 14th September (Hindi day), Hindi Day Celebration is held every year which includes ‘ Hasya Kavi Sammelan’ and prize distribution programme.